When is the adventures mostly to happen? When we travel. And there is even bigger chance when you think you are smart and got it all. I have a funny memory from my traveling in Croatia which comes from my stupid mistake. Two years ago I decided to create my own eat.pray.love experience and wanted to combine dancing, eating and a yoga retreat in one trip to Croatia. It was my second time of doing salsa festival in Rovinj and this time I wanted to stay longer, enjoy the town and see more of the country. So, I booked a flat in Rovinj for a solo stay and found a yoga retreat on the island of Hvar, near Split. Yoga retreat had been on my dream list for a while and I was happy to finally do it. I asked the retreat host about the best way to travel from Rovinj to Split and she recommended me the seaplane. Croatia is a very stretched country and bus to Split would take 12 hours. While the seaplane is only two hours – from Pula, where we usually fly from and to Oslo. Without further ado I bought a seaplane ticket for a reasonable price and didn’t do more thinking about it (my first stupid mistake). Monday night I arrived home from my favorite dance event – Croatian Summer Salsa Festival. Held in the fantastic town of Rovinj which has stolen my heart from the very first sight, four years ago. Two weeks I have spent dancing, meeting people and enjoying life. There has been so much enjoying that at times I wanted to throw my arms into the air and shout on the top of my lungs. The first time I enter the sea and it catches me in its arms like a lover, carrying me and stroking my skin. The moment I share a meal in the place from the last year, and the waiter recognizes us, laughs and brings schnapps on the house. The moment we dance and sing alone to “One love” reggae while the sun is going down over our last pool party. And all those moments I meet old friends, new friends – and then again say good-bye to them. I would come home at 6am at the sunrise and could not sleep, my heart overflowing with the emotions and gratitude. Love and gratitude have been the air I breathe in and out. I never expect great revelations from these two weeks as I go just for fun, chill, dance and swimming. And who would say that partying all day and all night, dancing at the beach, in the pool and on the streets, could be a source of any spiritual experience! 🙂 But here I am, full of happy memories and insights. And I want to share them with you. The lessons the life was teaching me on the dancefloor (and around it). This time I survived two weeks of dance madness: first, a week of Summer Sensual Days and then Croatian Salsa Festival. This has been my 3d time of this festival, and to my joy, happiness and tiredness I have added some valuable insights which make me feel something like a veteran 🙂 While chatting with a friend about my festival experience, I made a joke that I once will write my handbook of how to do the best of this festival. Wait a minute, I have a blog (which I kind of totally forgot in all that craze) – I don’t need to start a handbook to share all I know now! So how do you create your best and happiest experience? This goes for dancers and not dancers alike (so keep on reading, even if you are not a salsa enthusiast!). Once I had a dream to rent a flat in Italy and pretend I live there. Just for some weeks. Cook pasta, open a bottle of white wine and eat my dinner on the balcony. And just now I realized – I don’t need that anymore. 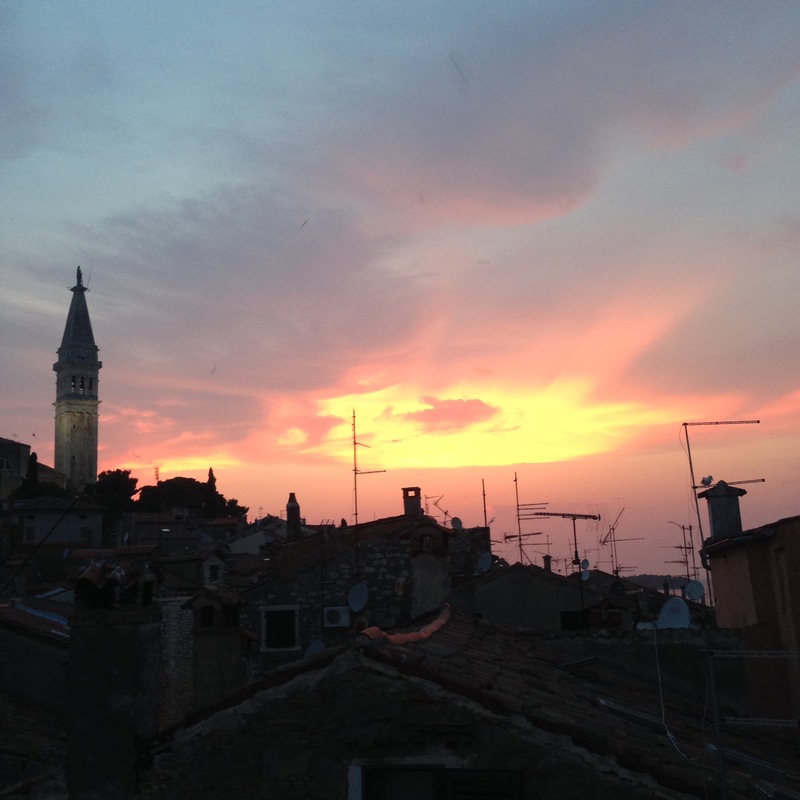 Here I am – back in Rovinj, melting with happiness. Renting a flat. For some weeks. Cooking my pasta. A bottle of local liquor stored. No balcony though, but there is an amazing sunset show just outside of my window. So I open my windows and sit with my pasta on the window sill. Which restaurant has a view compared to mine from the flat under the roof? The week of salsa festival was over after the Sunday night party. We didn’t sleep that night because my friend was catching a bus to the airport at 7.30 in the morning. So we decided to dance that night away, but no one was really dancing, not us at least. We were wandering from hall to hall, tired after the week of partying, observing how empty the space was getting. After I walked my friend to the bus station, I slept 4 hours, got up and hurried to the last event: the party boat with Cuban music. That was a great end to the week, such an exclamation mark instead of a full stop. Last summer I spent three unforgettable weeks in Croatia which I call my personal “Eat pray love” project. There was one week of salsa festival, a week of relaxing, eating and taking pictures in the beautiful town of Rovinj, and a week of yoga retreat on Hvar Island. Yoga would be the pray part, eating and relaxing speaks for itself, and dancing is definitely love. I have shared reasons to love Rovinj here and here, and the time has come to tell its stories. This is going to be the post about the dancing part aka love (you will find more posts about this story under the tag eatpraylove). I came to Croatia for the first time in summer of 2015 for the salsa festival and it captured my heart forever. On the night of our arrival we were pulling our suitcases through cobblestoned streets, the stones reflecting the light of the lanterns, the old houses towering around us, the laundry hanging from the windows – I felt like I was instantly placed in the setting of a romantic movie, and soon the cameras would roll. The town of Rovinj in the Northern part of Croatia is known as the most Italian town of that region Istria which used to be a part of Italian Veneto for ages. That’s why Italian atmosphere is luring everywhere, in the colorful facades, in the cuisine, in the smiles and jokes of local waiters. And what can be more romantic than Italian atmosphere in summer? If you ask me about the best time to visit Rovinj I would say the end of June, of course, when the salsa thing is going on 🙂 The energy is unique, it is like a all-night and all-day celebration going on. But in this post I want to share my reasons to love Rovinj, even if you don’t own glittering dancing shoes and don’t tremble at the sound of the Afro-Latin beat.